Grace Century, FZ LLC is among the experts offering information, to readers in the Pan-Asia area, within Panashco Media’s all new print and digital publication which caters to affluent investors seeking options abroad. Investment Life is considered to be Asia’s new investment and lifestyle resource for aspirational and high net worth individuals. 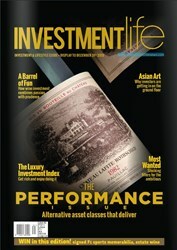 Grace Century, FZ LLC, an international research and private equity company based north of Dubai, in the United Arab Emirates (UAE), is featured in the first (November/December 2013) issue of Investment Life, Asia’s new high-end information and lifestyle magazine resource for aspirational and high net worth investors located in the Pan-Asian region. The publication is being launched November 15, 2013 and slated to reach a vast and relevant audience in Southeast Asia through a hard copy publication, newsletters, the website and events. Investment Life will reach a highly targeted readership based of over 60,000 readers across the pan Asiatic region. Readers from Singapore and Malaysia to China and Hong Kong will be provided with investment information, insight and analysis from experts in the region and around the world, adding value to the investment decision making process of its readers. According to Mallach, Investment Life is committed to bringing readers information on investment opportunities in the Southeast Asian region and further abroad. The Grace Century story was identified as adding value to the content of the magazine and its online channels. “Grace Century is an interesting story not only for the investments currently being offered to its members, but also due to its business model which stresses due diligence and careful selection as core values and processes to ensure investor returns,” he said. “We are thrilled to be included in the inaugural issue of Investment Life. The importance and influence of the region has dramatically changed our client base demographic and being included is a sincere honor,” said Scott Wolf, CEO of Grace Century, FZ LLC. Grace Century article is located on pages 90-91in the November/December 2013 issue of Investment Life. Grace Century FZ LLC is an International research and private equity consultancy located in Ras Al Khaimah, north of Dubai, in the United Arab Emirates (UAE). Grace Century specializes in “game-changing” life science and health related private equity projects.